"A wonderful New England creation, merging the sweetness of parsnips with a smoky cod broth. Good fish alternatives include haddock, pollack, cusk, or whiting. Smoked haddock and smoked pollack are good substitutes for the smoked cod. Use 1 1/2 pounds fresh cod alone if no lightly smoked fish is available. Great on cool Autumn evenings! Serve with hot, crusty bread and garnish with fresh chives." If the smoked cod has a strong smoky flavor, soak it in water for 30 minutes, drain, and rinse. In a large saucepan, cover the cod and smoked cod with water, and add the juice of half a lemon and the thyme. Bring the cooking liquid to a gentle simmer. Poach the fish for 8 to 10 minutes, or until the fish is just cooked and tender. Remove the fish to a bowl, and reserve the poaching liquid. When the fish has cooled enough to handle, break it into large bite-sized pieces. Set aside. While the cod is cooking, peel the parsnips, and cut them into 1/4-inch-thick slices. Peel the potatoes, cut them into 1/2 inch dice, and place them in a bowl of water to prevent discoloring. In a large saucepan or kettle, melt 2 tablespoons of butter or margarine over medium heat. Add onion, and cook until wilted and golden. Add the parsnips, potatoes, and 3 cups of the reserved poaching liquid. Bring the mixture to a boil, reduce heat, and cover. Simmer for 15 minutes, or until the vegetables are tender. Heat the milk and cream in a small saucepan. Do not boil. Stir to the vegetable mixture. Add cod and smoked cod; stir. Season with salt and freshly ground pepper to taste. Just before serving, stir in remaining tablespoon of butter. Top each serving with freshly ground pepper and chives. WOW! This is the best cod chowder I've had. It even beats the recipe in the Yankee main dish cookbook! You just HAVE to try it! This was really fishy and a little bland for my taste otherwise. My husband liked it pretty well though. 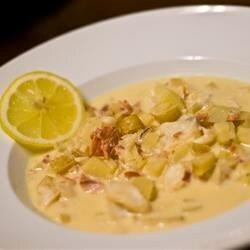 I've tried a few smoked fish chowder recipes, but this is the one I keep coming back to. The parsnip is an interesting change from the usual potato. A winter family favourite. Fantastic. Never quite enough liquid, though - we add water to make it a bit more "soup-ey". I really enjoyed this soup. I didn't have any smoked cod but i added andoullie sausage which gave an excellent spicy, smokey flavor. My husband loved it as well.